I was always nervous about anything involving egg whites. Even separating eggs seemed beyond me, having watched my mother fuss over a metal device which seemed to make the whole process rather complicated. Then I met my husband. Separate eggs? Nothing simpler. He just broke the egg and poured it into his hand, capturing the yoke in his palm and letting the egg white run into the bowl below. Let me reassure any clean freaks in the audience: he washed his hands before (and after) performing this egg-cellent feat. Need to beat egg whites to stiff peaks? No problem. He would take a whisk and a large bowl, add a pinch of salt and then bang those babies to attention. It does take a few minutes and a good arm, which probably explains why I could never manage it – having neither patience nor skill. I’ve retained the egg-separating trick and now have a mixer to do the egg whites. So, without further ado, here is how you make the best damn chocolate mousse ever. This recipe is supposed to serve six. It reminds me of another one of my mother’s expressions: “What do they mean? Six midgets?” Suffice it to say that if you are of sound of body and healthy of appetite, and have a sweet tooth, it can also serve four. I was amazed to discover there are only 3 ingredients (although the eggs are used in two ways) and absolutely no cooking involved. All you need is very fresh eggs and good chocolate. Using a spatula, gently fold egg whites into chocolate mixture in three batches. Careful not to make the whites fall! Refrigerate at least 3 hours. P.S. 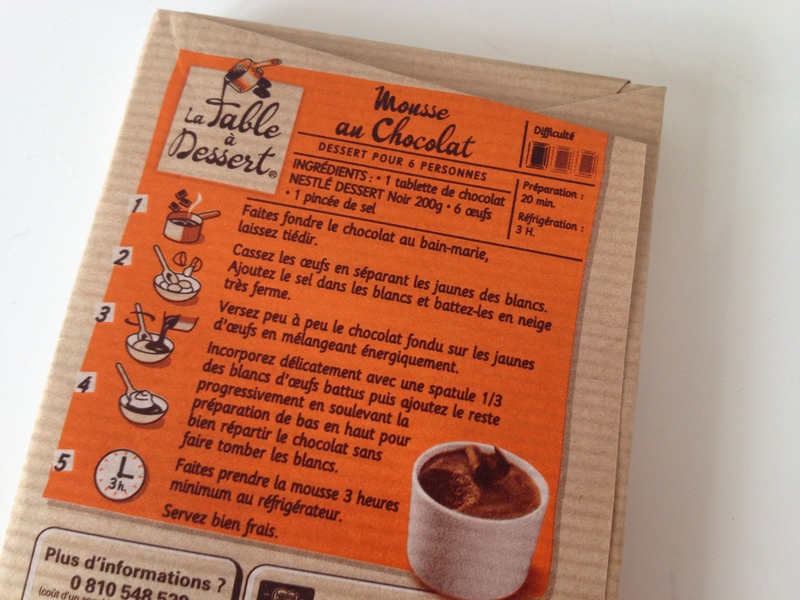 My deep dark secret is that recipe is not mine: it’s the one on the back of the Nestlé Dessert Noir. What’s your favorite dessert, homemade or otherwise? Are you a dab hand with a whisk?